1975. In Rome, Claude Lanzmann filmed a series of interviews with Benjamin Murmelstein, the last President of the Jewish Council in the Theresienstadt ghetto in Czechoslovakia, the only "Elder of the Jews" not to have been killed during the war. A rabbi in Vienna, following the annexation of Austria by Germany in 1938, Murmelstein fought bitterly with Adolf Eichmann, week after week for seven years, managing to help around 121,000 Jews leave the country, and preventing the liquidation of the ghetto. 2012. 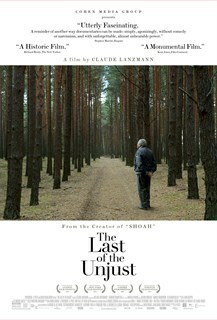 Claude Lanzmann, at 87 – without masking anything of the passage of time on men, but showing the incredible permanence of the locations involved –exhumes these interviews shot in Rome, returning to Theresienstadt, the town “given to the Jews by Hitler”, a so-called model ghetto, but a ghetto of deceit chosen by Adolf Eichmann to dupe the world. We discover the extraordinary personality of Benjamin Murmelstein: a man blessed with a dazzling intelligence and a true courage, which, along with an unrivaled memory, makes him a wonderfully wry, sardonic and authentic storyteller. Through these three periods, from Nisko in Poland to Theresienstadt, and from Vienna to Rome, the film provides an unprecedented insight into the genesis of the Final Solution. It reveals the true face of Eichmann, and exposes without artifice the savage contradictions of the Jewish Councils.